The Elements Series<sup></sup> provides an expanded choice in Fashion Door ware at an affordable price. In decorating your home, choosing the right paint, wallpaper, tile and trim is important in creating a personal design. The Elements Series of Fashion Door ware will support and enhance your decorating decisions. Classic lines and enhanced styling make Yukon a great choice for many home designs and the perfect enhancement for traditional or contemporary homes. This privacy knob/lever is best used in interior bed and bath applications where privacy is required. Both knobs/levers are locked or unlocked by turn button inside. The outside knob/lever can be unlocked by an emergency key. The crisp, clean appearance of the Satin Nickel finish adds to the overall look of the product and brings a modern feel. Amerock BP36602G10 Davenport 1-1/2in(38mm) LGTH Knob is finished in Satin Nickel. Simple lines and curves paired with strong, subtle finishes give the Davenport collection a distinct appeal. Installed horizontally or vertically, the balanced lines of these cast metal knobs and pulls add refined geometry to any space. The classic Satin Nickel finish provides a sleek, lightly brushed, warm grey metallic look. 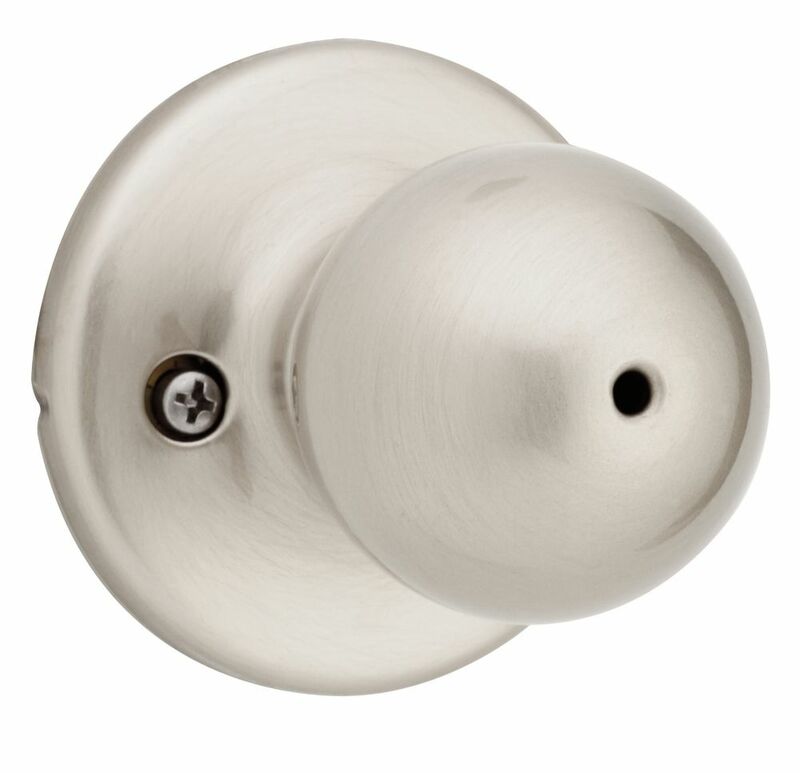 Yukon Satin Nickel Privacy Knob The Elements Series<sup></sup> provides an expanded choice in Fashion Door ware at an affordable price. In decorating your home, choosing the right paint, wallpaper, tile and trim is important in creating a personal design. The Elements Series of Fashion Door ware will support and enhance your decorating decisions. Classic lines and enhanced styling make Yukon a great choice for many home designs and the perfect enhancement for traditional or contemporary homes. This privacy knob/lever is best used in interior bed and bath applications where privacy is required. Both knobs/levers are locked or unlocked by turn button inside. The outside knob/lever can be unlocked by an emergency key. The crisp, clean appearance of the Satin Nickel finish adds to the overall look of the product and brings a modern feel.